During a day-long inspection, SIG inspected all 11 roofs, and carried out a process to grade the roofs. Some of the roofs were built on metal decks, while some were timber. The surveyors found that some of the roofs had no insulation at all, which would contribute to significant heat loss in winter months, combined with a risk of condensation issues. At Lightcliffe, some of the roofs are covered with heating plant which needs maintenance access. The state of the waterproofing covering was very wide-ranging, from old bituminous finishes covered with chippings, to single ply membranes and liquid waterproofing. Some of the roof coverings had been repaired or over-roofed with new membranes, but several of these had reached their “end of their useful life”. As with many different buildings that have been built up over time, drainage of water was a key factor. Many of the gutters between the roofs were also at the end of their serviceable life, and some had been repaired at various times with emergency paint-on products as a short-term remedy. 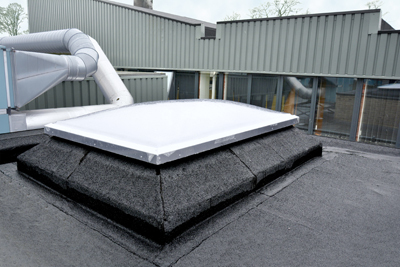 SIG recommended a new warm roof bespoke tapered insulation system, to conform to current building regulations using the SIGnature Bituminous Torch-On range of membranes. In line with the current Building Regulations requirement, insulation was provided with a U-value of 0.18 W/m2K. A plan of work was drawn to which was compliant with CDM 2015 Regulations, and involved maintenance being conducted over the summer holidays while pupils were away from the site. The programme included critical work to the roofs of two classrooms, the hall; dining room and kitchen roof and the roof over the boiler house. The leaks were worst in the multi-purpose academy hall which had a gutter over a large beam. This space is used as a dining hall and water was entering the building right above the area where the pupils eat. It was tracking along the beam and dripping onto the floor, damaging the timber flooring and was being collected in buckets, which formed a clear trip hazard as well as a health hazard. The inspection revealed that some of the roofs had old glass roof lights fitted with Georgian wired glass. These were very fragile and represent a significant risk to anyone working on the roof. They were replaced with new triple skinned roof domes which have been tested for safety and strength. Around the roof areas there were various types of upstands and timber cladding, some of which are damaged or aged and were renewed with composite panels which have a long life, requiring no significant maintenance. There were also some lead parapet outlets, and around the hall roof a set of high level windows which needed to be replaced, so the life of the new roofs would not be affected by any deterioration in the surrounding fabric. As part of the survey, the inspection team took some core samples from various areas of the roof to identify the roof build-up and type of deck along with confirming the condition of the materials and identifying which areas needed replacing. The sampling process also enabled testing for moisture in the roof, identifying both the leaks and interstitial condensation. During the inspection, serious problems with the metal decks came to light. Every deck inspected at the academy had been laid the wrong way around, so that instead of draining down the fall, rain water sat in troughs causing internal rusting. While they collected core samples, SIG discovered that the decks were incorrectly laid, so provision was made in the tender process to cover for deck replacement or repair. Hence, there were no unexpected surprises nor any additional costs to the school. Had the roof deck been installed properly in the first instance, the maintenance team would have been able to save it rather than replace the majority of the deck. 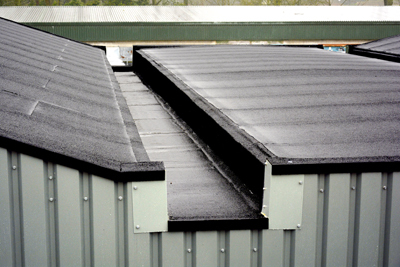 Once the metal decks were repaired, the roofing contractors installed a new SIGnature metal lined Vapour Control Layer (VCL), which was torch bonded to the repaired metal deck. 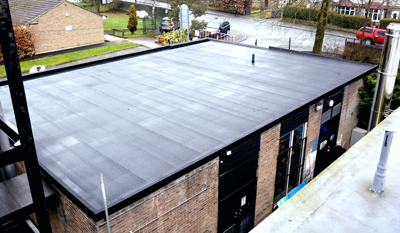 The other two roofs in the project, over two classrooms, were overlaid with a new membrane – SIGnature Elastomeric Torch-On System- without the existing build-up having to be removed. Whilst these roofs were leaking, the build-up was in otherwise good condition, so therefore another type of overlay became an option. The school boiler room roof was a typical 1960s construction, with a top surface comprising a layer of limestone chippings on top of two layers of bituminous underlay. Beneath this, in keeping with the building specifications of the time, was a layer of fibreboard insulation. In turn, this insulation was laid over a VCL; another bituminous membrane installed to meet the previous British Standard BS747 for vapour control. The VCL was laid directly onto a profile metal deck providing the structure of the roof. Stripping the roof away revealed an important discovery. Water sitting in the deck troughs, meant it had rusted through due to apparent failure of the waterproof layer. This clearly meant the roof was no longer structurally sound, however, SIG’s Health and Safety procedures had prepared the roofing contractors for such eventualities. 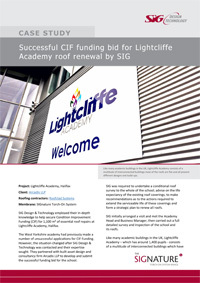 “We find the approach of SIG both welcoming and refreshing as they were always prepared to be flexible, looking at all times to work with the Trust to meet our changing needs and requirements. “They were always professional in their approach and were very proactive in the way in which they managed the project, much of which was carried out in a live school environment.